Drawing for Pure Silver-Plated Genuine Crystal Infinity Pendant Winner Drawn October 1, 2014. 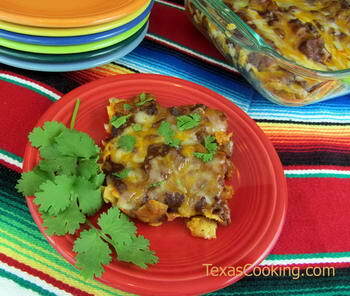 Frito Pie Comfort It's getting cooler, and we've noticed an increase in folks visiting our recipe page for Frito Pie. Looking for something more substantial to make for dinner? Here's our recipe for Tamale and Frito Pie. There's four ingredients! What can possibly go wrong? This week's Lone Star List features new stuff around Texas, and Don't Feed The Ducks Public Service Announcement. September is National Biscuit Month. Why do Texans pass the biscuits?. This four-ingredient recipe makes a great Tex-Mex treat just as it's written here. But I bet you're already thinking about what ingredients you could add to make it more interesting. Chopped onion and black olives immediately come to mind. You can tell at first glance this recipe is at least several years old because it calls for a 1-pound can of chili. Canned chili is convenient, and Wolf Brand (no beans) is pretty good, but they along with everybody else have reduced their one-pound cans to 15 ounces (see Note). Also, depending on where you live, it may be difficult to get your hands on good tamales. If frozen tamales in the shuck are used, thaw them before using. Good tamales and chili make all the difference in this dish but, like I said, even if you put it together quickly with canned chili and canned tamales, it's a good, warming dish. If you want to double the recipe, use a 9x13-inch dish. Preheat the oven to 350F degrees. Spray a 7x11-inch baking dish with non-stick spray. Heat the chili in a saucepan just until it comes to a boil. Remove from the heat. Lightly crumble the Fritos (don't make Frito dust) and spread in the baking dish. Place the tamales on top of the Fritos with a little space between each one. Cover with the hot chili. Bake uncovered 20 minutes. Sprinkle with the shredded cheese and bake 5 to 10 minutes more, until the cheese melts and the mixture is bubbly. Yields 2 to 4 servings. Food & Wine Magazine - The People's Best New Bars Dallas comes up dry, for bars go to Houston, Austin and San Antonio. For those of you currently watching The Roosevelts on PBS, here's a Texas connection Kermit, Texas is named for TR's son. A Gentle Reminder: PLEASE DON'T FEED THE DUCKS HUMAN FOOD!